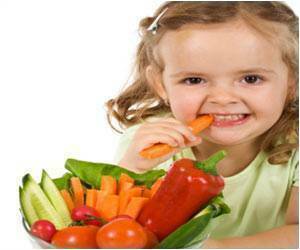 Sensitivity to bitterness, which is common among children, make them to turn away from eating their vegetables. A new study has found that adding a small amount of dip to a serving of vegetables helped them eat more of them. The study, led by Jennifer Orlet Fisher, director of the Family Eating Laboratory at Temple's Center for Obesity Research and Education, published on line this month in the Journal of the American Dietetic Association, studied 152 pre-school aged children in the Head Start program who were served broccoli at snack time over a 7-week period, and found that offering 2.5 ounces of ranch dressing as a dip increased broccoli consumption by 80 percent among bitter-sensitive children. Low-fat and regular versions were tested, and both were equally effective. "We know that children can learn to like vegetables if they are offered frequently, without prodding and prompting," said Fisher. "Children with a sensitivity to bitterness may avoid certain vegetables, but offering a low-fat dip could make it easier for those foods to become an accepted part of children's diet." She added that parents don't necessarily need to stick to dressings high in fat and salt to see a positive effect. "Try applesauce, hummus, or a low-fat yogurt-based dip for more calcium," she suggested. Dislike of the bitterness in some foods may stem from the TAS2R38 gene, which influences how we perceive bitter tastes. To determine which children in the study had this sensitivity, researchers offered each child a cup with increasing amounts of a bitter-tasting compound common in green vegetables. After each cup, the child was asked whether the fluid tasted like water, or was "bitter or yucky." About 70 percent of the children responded in the latter. "Parents and caregivers do not make laboratory measurements of children's bitter sensitivity, but most will know if their child is wary of vegetables," said Fisher. "Our research shows that offering dip is another tool that parents can use to help children learn to eat their vegetables."